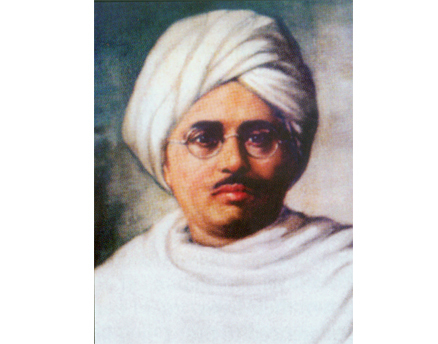 Lala Har Dayal (October 14, 1884 – March 4, 1939) was a nationalist who founded the Ghadar Party in America. He was a polymath who turned down a career in the Indian Civil Service. His simple living and intellectual acumen inspired many expatriate Indians living in Canada and the USA. Har Dayal was the sixth of seven children of Bholi Rani and Gauri Dayal Mathur. His father was a Reader in the District Court. Under the influence of his devoted mother, Hardyal in his boyhood visited and prayed at a Delhi Temple dedicated to Lord Shiva. Along with his academic studies, he also studied the ‘Gita’, ‘Manu Smriti’ and ‘Rig-Veda’. The Government of India awarded him a scholarship of 200 per annum for higher studies in England. He joined St. John’s College, Oxford, for the Honours Course in Modern History. He also did his Ph. D. from the London University.In London he came under the influence of Shyamaji Krishna Verma, Editor of the Indian Sociologist and a recognized leader of the Indian Revolutionary Movement. He also came under the influence of Vinayak Damodar Savarkar and Madam Cama. He went to Lahore in 1908, stayed with Lala Lajpat Rai, met his associates and suggested ‘passive resistance’ as a weapon of struggle against the British. In this he anticipated Mahatma Gandhi by ten years. In 1911, Lala Har Dayal moved to the United States and joined the Stanford University as Professor of Sanskrit and Philosophy. He was the secretary of the San Francisco chapter of the Industrial Workers of the World. The body was granted land in Oakland and he helped set up the Bakunin Institute of California there.His association with the Indian immigrants had also been growing. To encourage young Indians to come to the United States, he convinced Jawala Singh, a wealthy farmer, and set up the Guru Gobind Singh Scholarships for higher education at Berkeley in USA. On the lines of the home of Shyamji Krishna Verma in London, he opened his own rented accommodation house for these scholars — this was known as India House. Events in India, especially the assassination attempt on the Viceroy, further fuelled his nationalist fervor. He addressed Indian community groups and exhorted them to liberate mother India with the force of arms. During his visit to Astoria, Oregon, Gadar Movement was born with Sohan Singh Bhakna as president and Har Dayal as secretary general. The movement spread like wildfire in the United States with large number of immigrant Indians joining – these included the students as well as the workers. To spread their message, the Gadarites brought out a newsletter in different languages. The newsletter, also called Gadar, talked of revolution and a violent overthrow of the British from India. They also gave instructions on bomb manufacture and use of explosives. The onset of the First World War was seen as an opportune time to launch the offensive in India. As such, several thousand Indians returned to India by sea with arms, explosives and funds. In April, 1914, Lala Har Dayal was still in the United States when the American government, under pressure from the British, came to arrest him on charges of spreading anarchist propaganda. The British had tried to force the Americans to deport Lala Har Dayal, but that did not happen. He managed to obtain bail and moved to Berlin where other Indian revolutionaries in exile had set up the India Independence Committee. Sacrifice of family : Hardayal was married to Sundar Rani, Their son, born two years later, died in infancy, but their daughter, Shanti born in 1908, survived. The sacrifice of Har Dayal’s family was immense. She lived an entire lifetime away from her husband who was away working for the freedom movement. His daughter never saw her father in her lifetime. His View on Sanskrit : Some people say that Sanskrit is a dead language and it cannot be commonly used for purpose of national business. This idea is altogether erroneous. It is easier for a Hindu to learn Sanskrit than English. Sanskrit is not dead – it is we who are dead. Those who desire to make a great and United Nation must take their stand on Sanskrit as the eternal refuge and glory of the Indian people. Last Years : The last years of Lala Hardayal were wrapped in mystery. He died in Philadelphia on March 4, 1939. In the evening of his death he delivered a lecture as usual where he had said “I am in peace with all”. A very close friend of Lala Hardayal and the founder member of Bharat Mata Society , Lala Hanumant Sahai did not accept the death as natural, he suspected it as poison. This entry was posted in Biosketch, History, Nation and tagged Freedom movement outside India, Gadar Party, Indian freedom struggle, Lala Hardayal on March 4, 2014 by arisebharat.